I've been working on this pattern, and am almost done. I still have a few lining and finishings to sew. Yesterday I tried it on and it just didn't seem right. It hit me in kind of a weird spot, and make me look more stocky than normal. 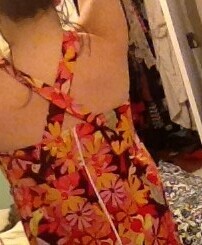 If it was already too short, it would be even worse when I hemmed it. 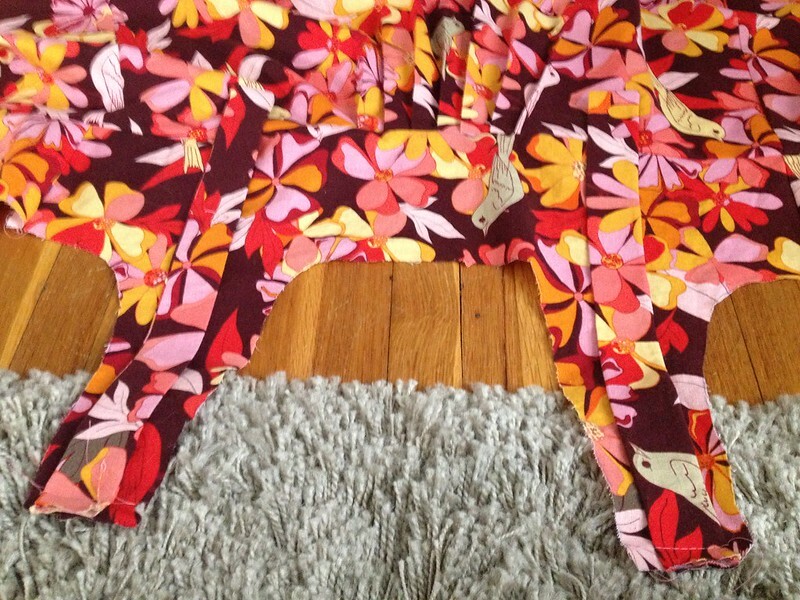 I spent awhile trying to figure out how to lengthen and pattern match it so it didn't look like a mistake. I quickly realized that if I put on a ruffle, it would a) be easier than trying to pattern match and hide seams, and b)just look way better than any other option. So much more flattering right? Totally evens out my line backer shoulders a bit better. I mean lets ignore the fact that I didn't have enough fabric to even keep the pattern doing the right way, but I don't think it matters. It's busy enough I don't think many people will notice, and it's just a little summer dress anyway. I still need to under stitch my lining, finish my interior seams, add the back buttons and maybe put in a waist stay. I did have a bit of a zipper malfunction So I tried sewing an invisible zipper with my machine's zipper foot instead of the correct invisible zipper foot. I hate to admit it's because I was too lazy to go downstairs to look for it, but that was really the case. So my invisible zipper is very visible. 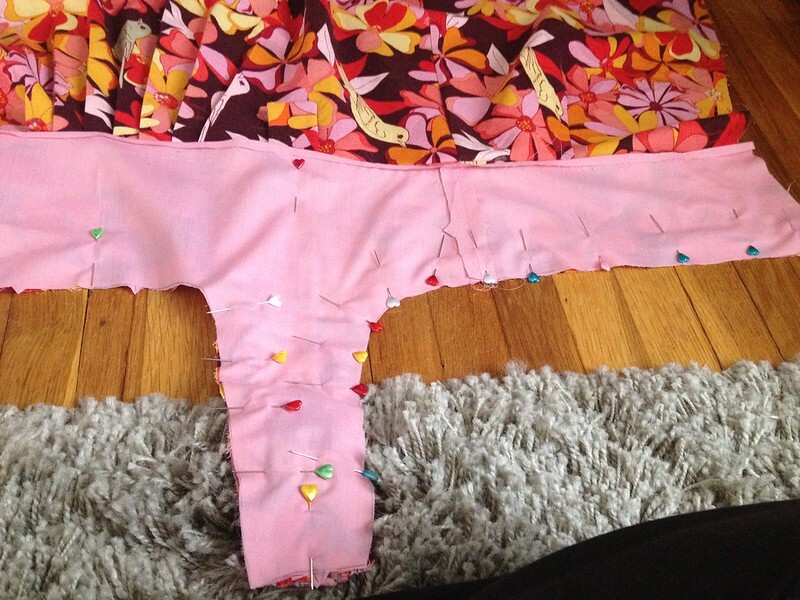 I'm REALLY don't want to pink the entire zipper, but it looks like I might. I think I should have a huge poster in my house that says, "Just do it right the first time." because I swear it'll be my downfall. I \got kind of confused when I was sewing in the lining. What on earth I was supposed to do with the straps? So here's how you sandwich them in case anyone else has the same issue. So you lay your outer bodice right side up, and fold you basted straps down so that everything lays flat and all the right sides are touching. Then you pin your lining on top of that, right side down. You need to be extra careful not to sew the strap into the seams with this method, but it looks really good when you do it right. I added extra pins just to keep the strap still. I should be all done with nice non iPhone photos of the finished product this weekend. I forgot how much I liked to sew! It's a good thing too, because I'm on a bit or a spending freeze in preparation for two upcoming vacations to LA and PR. So this is the only way I'll be getting any new clothes, but I'm okay with that. I have a huge pattern and fabric stash, so it's about time I put it to good use! Posted in sewing . Bookmark the permalink. RSS feed for this post.